Since R2 2018 Telerik UI for WinForms suite offers RadChat control. This control provides rich conversational experience that goes beyond the natural language understanding and personality of your chatbot. This allows developers to easily implement conversational UI in their applications by utilizing AI powered framework that works with natural language processing, by following a predefined logical tree, or just for integrating P2P chat capabilities in their applications. Integration with all the major conversational UI APIs or services available today – Microsoft Bot, Google’s API.AI, Amazon LEX, and more. 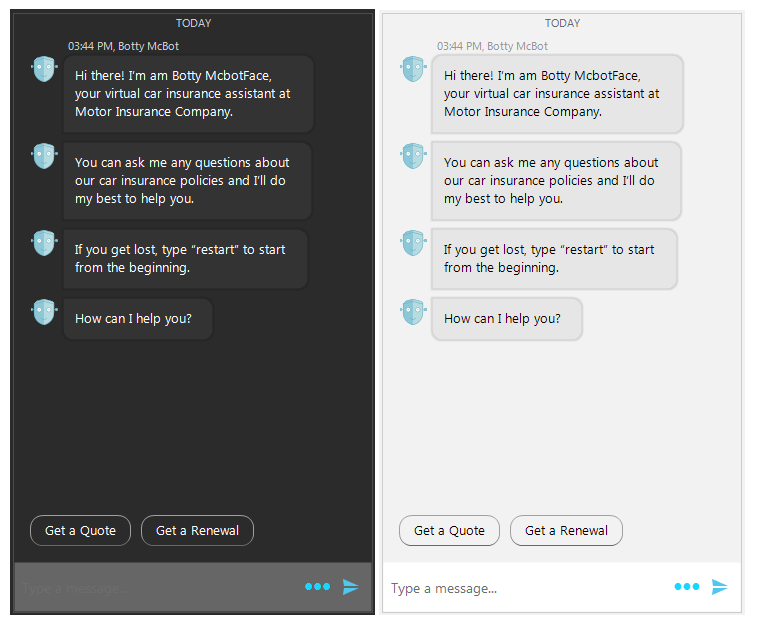 You can refer to our Demo Application >> Chat UI examples. Cards: product cards, flight cards, weather cards, etc. Overlays: calendar, time picker, list, etc. Highly customizable message and card content. Toolbar which allows adding custom actions (adding an image for example).